A pair + a spare = a TRIO of stockings ! That's the slogan in French. "If this stocking runs we'll replace it" so we're offering an extra stocking just in case. 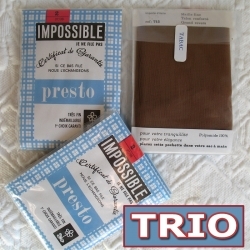 This "trio" is possible thanks to each stocking being in its own individual packet. 100% Nylon, first quality, a fine weave with a crossed pattern so that they won't run. Each stocking is individually packaged. Before wearing, we recommend you wash them gently in lukewarm soapy water, this will help soften them. Please refer to the size table and contact us if you have any questions.